Using space wisely helps us to make the most of our homes and gardens. Small spaces require you to think about planting vertically. As my yard becomes ever crowded, I focused on simple concepts for vertical gardens. I heard someone say that gardeners will fill up every available space, and that they will create vertical gardens when the horizontal space has been used. I guess that I am at that point. Although I have not been writing, I have been working in the garden. I wanted to experiment with the idea of verticality in the garden space. Vertical gardens fall into different categories: climbing plants; beds in long containers raised above the ground; and the garden wall. I have been playing with all of these concepts, so I wished to share my experiments with you. I have seen some beautifully constructed wood structures that can be best described as a cross between shelving and raised beds. Along those same lines, I have seen elaborate PVC pipe systems which are angled to allow water flow down gentle slopes to the bottom. Holes in the pipe contain plants. Simpler still are plant stands and trees of hanging baskets. Since I had many goods which could be recycled, my focus was to find ways of using these materials. Leftover pipe from my drainage project became beds by cutting long openings in the top. I did not imitate that structures that I had seen, since I did not have that much pipe. Two poles were drilled through the pipe. A metal tube became the main supports. Smaller PVC tubes spaced the longer tubes to the right heights. Then two wood braces tie this structure to the fence. This was all recycled material. With cuttings from my crepe myrtle and old plastic bottled drink flats, I made a few starter flats. The flats are so high that the obtain sun longer than the bed did below. In this case, the four crepe myrtle trunks were used to create a shelf frame. The drink flats were attached to the cross members of the frame. A piece of plastic that came from a sliding door blind helped cover the holes of the flats. A foot board from a bed became the basis for another raised container bed. This was a metal tube four poster bed. The spaces between tubes had plastic garden pots place in them. 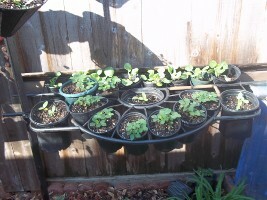 I am now growing strawberries, cucumbers (which I hope will spill over), and brussel sprouts. 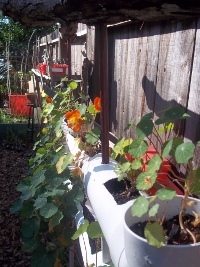 I also used old lamp shades as containers that were placed on a pole. Trellises, poles, and fences all serve for climbing plants. I am growing my grape vines on poles which go up around fifteen feet. The grapes will be pruned to cascade from the top of the pole, creating a grape vine fountain. When many gardeners discuss vertical gardens, climbing plants is their focus. Cucumbers, squashes on vines, beans, and grapes are a few standards for this type of vertical gardening. 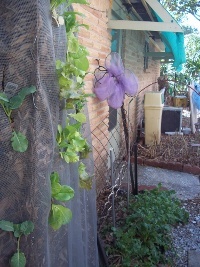 Some of these plants have wonderful flowers, so a trellis on a porch can make a great screen while providing a harvest. Have you seen the work of Patrick Blanc? His work in vertically landscaping might be the best known, and many gardeners are finding ways to imitate what he has done for their own vertical projects. These are walls of plants that have a fascinating artistic feel. These gardens rely upon running water which supplies the nutrients. My version is a bit different from other projects you will find around the internet. First, I am not using running water with a trough. I had the spring section of a mattress. Mattresses are the hardest item to recycle, and I wanted to find something to do with it. The spring frame is held vertical with poles driven through the center. I filled the springs with leaves and compost. Here comes the only item that I purchased for these projects: window screen material. After the spring frame had been filled, I covered the frame with the window screen material. This holds in the leaves and compost, but it does allow water to flow into the structure. I cut slits into the screen. I then had to use a wire cutter to remove a bit of the frame. Finally a plant was placed into the hole. 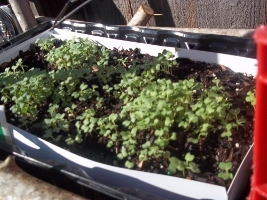 Currently I am growing lettuce, mustard, oregano, and mint in this vertical method. The Black Seeded Simpson lettuce is doing well. Oregano likes dry places, so it is fine. The mint is also good. I water by spraying the structure with the hose. Oh, I also have broccoli growing on the side. I am hoping that this wall will block the heat from the sun, while giving me a larger growing surfaces. I am happy with the results. I want to focus on the garden wall concept. Maybe I can use a solar powered pump to create a vertical garden wall like the others have done. My dry vertical wall has not needed anymore watering than the other containers. What can you recycle for a vertical garden? Whatever your imagination allows.